Yang Hengjun reflects on the role of reporters — and the risks they face each day. Many year ago I created a definition for “the people’s spies”: people who hide in the darkness for the sake of the light. This is what I mean by “the people’s spy”: a “spy” who reveals to the people the secrets of evil regimes and corrupt governments. Sadly, this is just a character that I invented in a novel. In reality, “spies” not only always belong to the organs of national and party power, they also are often used by the government as tools for dealing with the people. But there is a profession that has some similarities to spies – reporters. How are they similar? Both dig up secrets, reveal the truth, and expose what it hidden. The difference is that spies serve the regime and are mostly used against the people, while journalists serve the people and mostly work to check or even confront the ruling authorities. Some people may say that this is rubbish – spies live dangerous, exciting lives while reporters are little more than “prostitutes.” If you think this, you’re wrong. In times of peace, reporters face far more danger and take more risks than spies. Plus, these anonymous spies are becoming more and more timid, while reporters hoping to uncover scandals are becoming braver and braver. According to my knowledge, although we’ve seen unending conflict around the world over the past three years, in that time less than two dozen spies were killed or “vanished” (this information is never publicly released, but I have my own sources). But what about reporters? According to the Press Emblem Campaign, there were 141 reporters killed in 2012 and 129 killed in 2013. In 2014, at least 128 reporters were killed around the world. 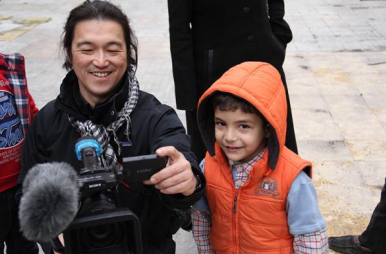 2015 had barely begun when the Japanese reporter Kenji Goto was murdered by the terrorist group Islamic State. My own experience isn’t small, but I have to admire the career arc of Mr. Goto. He traveled to most of the regions ravaged by war and conflict around the world. Chechnya, Albania, Kosovo, Liberia, Sierra Leone, Afghanistan, Iraq, and Syria – he has left footprints in all these places. How many times did he walk the line between life and death, taking photographs among the corpses and working with soldiers’ guns aimed at his head… And he didn’t belong to any organization; he was a lonely reporter – a hero. It is because of reporters like Kenji Goto that we’ve been able to see pictures that we never could have imagined, images that caused us to rage against war and yearn for peace. So tell me, is Mr. Goto’s contribution to the world and to the people really smaller than that of a devious spy? "Unless China invests in counter-terrorism operations internationally, it will face the consequences domestically."